As I mentioned in yesterday’s post I spent a good portion of my week getting ready for Tales of the Cocktail, but I left it at that. I can only assume that those of you reading CH who aren’t crazy cocktail geeks might be wondering what exactly Tales is. To put it succinctly it’s a conference. A cocktail conference to be exact, but, and I’m completely speculating here as it’s my first time to Tales, I think it’s something more than just a conference. For Aaron and I it will be an opportunity to meet some of the people we’ve “conversed” with only digitally. It’s a chance to try new drinks, ingredients and learn a ton. But most of all it’s a chance of us to have a truly fantastic time in New Orleans. It’s my intent to post during the week and give brief updates on what’s going on, but I certainly can’t make any promises. We only spent a half day here today and already I’m a bit wiped out. However, I’m also fat, dumb and happy as a result of some tasty cocktails, wonderful food and some amazing sights. If I don’t get a chance to post during the week please be sure to take a look at the official Tales of the Cocktail Blog as Aaron and I will be writing a post about our impressions as first time attendees at Tales. 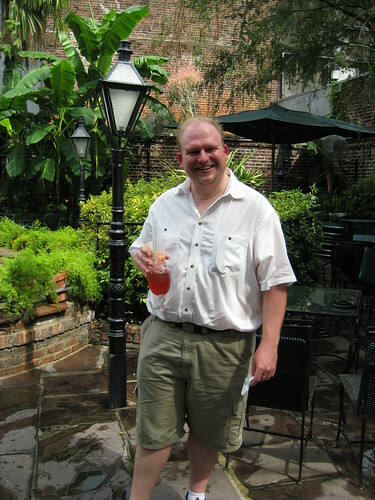 [Note] That is indeed a Hurricane from Pat O’Briens. Despite it’s made-from-mix-ness it was still relatively tasty and quite refreshing after getting rained on. This week has been a bit on the crazy side as I’ve been getting ready to head to New Orleans for Tales of the Cocktail (TOTC). More on that tomorrow. Thankfully throughout the week I had the Americano to turn to for a refreshing summer cocktail with a wonderfully complex flavor and a nice hit of bitterness. I stuck with the recipe I shared at the beginning of the week as it seems to be the agreed upon standard. The resulting drink is very refreshing, not at all heavy and the complex flavors of both the vermouth and the Campari really shine through. There are some weeks where I mix up the cocktail simply to try it and while I usually enjoy the drink I don’t necessarily crave it. The Americano was different. I found myself mixing them up this week, not simply to try them, but because I truly wanted one. Yesterday, for example, I was running around getting my ducks in a row for TOTC. It was warm and I was a bit thirsty and as I openened my fridge I found myself unconciously reaching for Americano ingredients. For the record, it was the right choice. There is one caveat though. If you don’t like bitter flavors (eg Campari) then you might want to adjust the ratios for this drink. 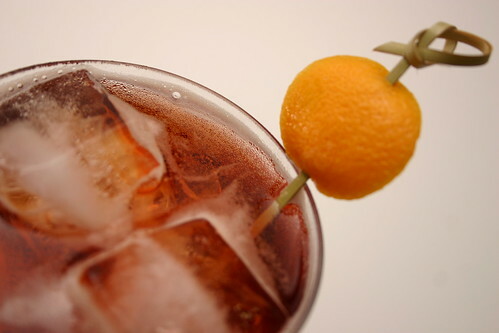 Try dropping the Campari a bit, the sweetness of the vermouth will help take care of the rest. For me though, the 50/50 Campari to vermouth ratio was just perfect. That’s not a huge surprise though as I’m also a big fan of the Negroni. While you’re mixing up an Americano for yourself I’ll leave you with a couple recipe oddities that I found interesting. First, in my Mr. Boston Deluxe Official Bartender’s Guide from 1974* the recipe listed calls for 4 oz of sweet vermouth in an ice filled glass topped with club soda and a twist of lemon. Without the Campari I don’t think you can really call that an Americano at all. Second, in the American Bar by Charles Schumann the recipe calls for equal parts sweet vermouth and Campari garnished with lemon and orange twists. Note the lacking soda water. While I’d still be mostly willing to call this variation an Americano I think you’d lose a good deal of it’s refreshing nature without the soda. Plus at that point why not add another part gin and have yourself a Negroni?